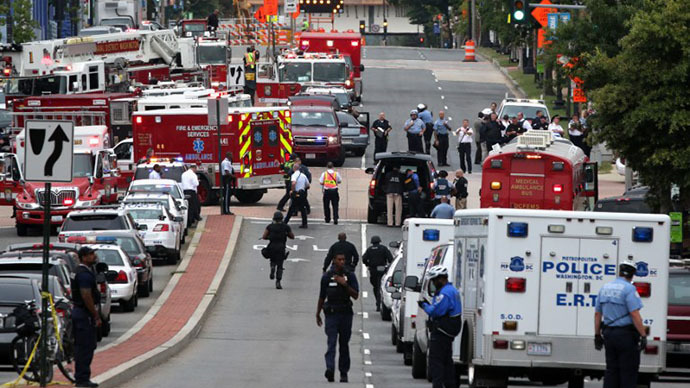 A heavily armed tactical response unit that initially responded to the Washington Navy Yard shooting was told by its superiors to stand down before the suspected shooter was killed. The advanced four-man Containment and Emergency Response Team (CERT) that usually guards the nearby US Capitol complex was one of the first armed teams on the scene to aid municipal police officers. The CERT unit was quickly told to leave the scene by Capitol Police command. Former Navy reservist and tech contractor Aaron Alexis, the suspect in the shooting that left 12 people dead on Monday morning , had the proper security clearance to enter Building 197 – the headquarters for Naval Sea Systems Command - at around 12:15 GMT. Alexis, armed with a shotgun and pistol he took from a security officer he shot, began firing into a building atrium shortly after his arrival. Sources told BBC News the CERT received notice of the shooting around 12:20 GMT and arrived at the scene a few minutes later. They were wearing full tactical gear and were armed with HK-416 assault weapons. A Capitol Police source said the CERT was told by an officer of the Metropolitan Police Department, the District’s local police force, that it was the most advanced and equipped response team at the scene upon arrival. Nevertheless, the unit’s commander ordered them to leave the scene. The suspect was eventually killed at 13:00 GMT. "I don't think it's a far stretch to say that some lives may have been saved if we were allowed to intervene," a Capitol Police source said. In addition, the Capitol Police Board is forming a “Fact Review Team” run by a former US Secret Service official and aimed at investigating the claims. Officials are also probing radio logs from Monday morning and interviewing officers involved, according to Senate Sergeant-at-Arms Terry Gainer, who has oversight of the Capitol Police. "It's a very serious allegation and inference to indicate that we were on scene and could have helped and were told to leave," he said. "It crushes me if that's the case." The CERT unit’s primary responsibility is to guard the Capitol, though it will respond to off-ground scenes if asked. Yet the Capitol Police source who heard the Monday request for CERT assistance said there is some trepidation among first responders to venture off Capitol grounds for fear of discipline. "They were relying on our command staff to make the right call," another Capitol Police officer said. "Unfortunately, I don't think that happened in this case." The US Department of Defense ordered Wednesday a security review at its facilities worldwide, including security clearances. "Time frame, the depth of the clearance, kind of clearance, access, different clearances given to individuals. We're going to look at all that," Defense Secretary Chuck Hagel said during a news conference. "Obviously the longer clearances go without review, there is some jeopardy to that. There's no question about it. So we're going to take a look at every one of those components." Hagel has ordered the military to look at all existing security measures, check their sufficiency, and determine what other measures may be needed. On Tuesday, US lawmakers demanded a review into how Alexis kept his security clearance despite numerous violent incidents and run-ins with the law on his record. "I want to know who conducted his [Alexis'] background investigation, if that investigation was done by contractors, and if it was subject to the same systemic problems we've seen with other background checks in the recent past," US Senator Claire McCaskill said in a statement to Reuters.